Had you asked me about my 'skincare routine' this time last year, I would have laughed you out of my room with a packet of face wipes in hand. Thing is.. I was always quite lucky with my skin as a youngster and never really went through that 'teenage spot prone' phase. I have however had some problems in the last few years that have managed to time themselves perfectly with all of my friends blossoming out of spot prone skin into the enviable clear skinned ladies that they are. Anyway, enough about my skin history and onto the good stuff : my current go - to evening skin care routine. Every 2 or 3 Days | Clinique Clarifying Lotion: I used to use this every single day morning and evening but I think as I've finally started to understand my skin, I've realised that it really doesn't need a scrub or exfoliant every day as it'll just freak out and go all red & blotchy.. no-body wants that. Since using such a nourishing cleanser though, it's good to use a chemical exfoliant every now and again just to get rid of any dead skin cells and smooth everything out a bit. Once A Week | Origins Clear Improvement Mask: I try and do a face mask around once a week and tailor it to whatever skin issues I may be having that week whether I need some intensive moisture or something to draw out all of the impurities. I recently came into contact with this amazing active charcoal mask from Origins though and I really feel like it works wonders for basically everything. My skin feels so much softer, looks so much clearer and doesn't feel stripped at all when I remove it.. expect it to be making an appearance in my next faves video! Every Night | Origins Original Skin Renewal Serum : I know, I haven't stopped banging on about this since I got it so I'll try and keep it short and sweet. This product fills a massive hole in the market by catering to the skin of 'twenty-somethings' and as a 24 year old (Good God) that's something I can get down with. It's brightening, neutralising, and sinks in really quickly. Oh, and as with all Origins products, it smells just dreamy. If you want a more in-depth review and to read my first impressions, then just click here. Every Night | Kiehl's Midnight Recovery Concentrate: This it the first ever oil I put on my face and I haven't looked back since. It smells like I'm getting some sort of spa treatment and by morning my skin just looks a whole lot better in all of the ways. I find it hard to pinpoint exactly what's happening but what I can tell you is that since using it, I've noticed that my complexion has become more even, my skin doesn't get as many stubborn try patches, and any scars or hyper pigmentation caused by spots or random flare ups are significantly reduced. It also lasts SO long, so you wouldn't have to worry about re-purchasing for a long time. Every Other Night | The Body Shop Aloe Soothing Night Cream: I used to use this every night but found that along with all of the other products I was using, it was just a little bit too intense for my needs. I've never really gotten excited about moisturiser before as it's kinda the bane of my life as my skin can't make up it's mind about what it needs and how it's going to react. This little product has been a firm player in my skin care routine for a decent few months now though. It's great for sensitive skin and it's really thick and nourishing so you really don't need much. It sinks in reasonably quickly for a night cream but as with most, you'll still be a little bit shiny pre-sleep but who really cares? By morning my skin feels beautifully moisturised and significantly calmer and for that I am eternally grateful! I've heard so many good things about the Kiehl's Midnight Recovery Concentrate but I haven't tried it as I can't handle the lavender scent. 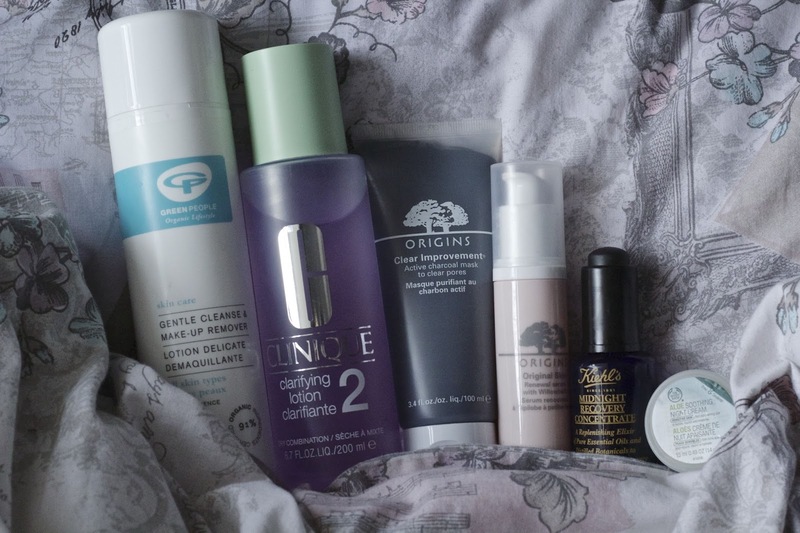 The Origins Skin Renewal Serum is next on my list to buy when I run out of my current serum. At the moment I'm loving the REN Omega 3 Oil in the evening. I love the Origins clear improvement mask and I'm seriously tempted by the skin renewal serum after seeing your review earlier! I'm definitely getting to this place in life where I'm like "I should probably have some kind of actual, reliable routine by now..." I've never been bad about taking care of my skin, like, I don't sleep in makeup or anything, but I'm a wash & moisturize, then call it good kinda gal. This post couldn't have come at a more perfect time for me, with trying to nail down my own routine. Some of these products sound so lovely, too. I'm loving the Origins Skin Renewal Serum, it smells amazing and I don't really know what it does but it makes me skin feel amazing and looks brighter. It definitely feels like its doing something good for me! Thanks for sharing your skincare routine! I'm still trying to figure out what is the best choice for me :( I was also quite lucky with my skin as a youngster, but now I've got some redness on cheeks. Only a variety of different soothing natural remedies like these help me to reduce it. Natural, calming ingredients are so hard to find in mass beauty products.